Welcome to Varengold’s Daily FX Comment. We hope we were able to report you significant news and analysis during the past days. Anyway, the weak major currencies at today’s opening are the EUR and AUD. We wish you a successful trading day. The EUR fell to a one-week low versus the JPY before reports are expected to show that German consumer prices dipped while the unemployment rate rose this week, which supports the expectations the ECB would leave its interest rates low. The jobless rate in Euro-Zone’s biggest economy may climb to 8.3 percent in October from 8.2 percent in the previous month, a survey showed. Another survey showed that the ECB could let its benchmark interest rate at 1 percent though the second quarter of 2010. The central bank’s next policy meeting will be on November 5th. The EUR dipped for the third day against the JPY to 134.90 after starting the week at 138.25, losing over 330 pips this week. Yesterday the EUR fell also against the USD. The pair reached a low at 1.4770, which was the lowest level since October 13th. The AUD dropped also against the JPY as a report showed that the nation’s inflation slowed, which reduces expectations the RBA will increase interest rates. Today the AUD/JPY fell over 130 pips after it reached a low at 82.71. It is the third day that the pair is weakening. Anyway, the nation’s consumer price advanced 1 percent from the second quarter, as it gained 0.5 percent. 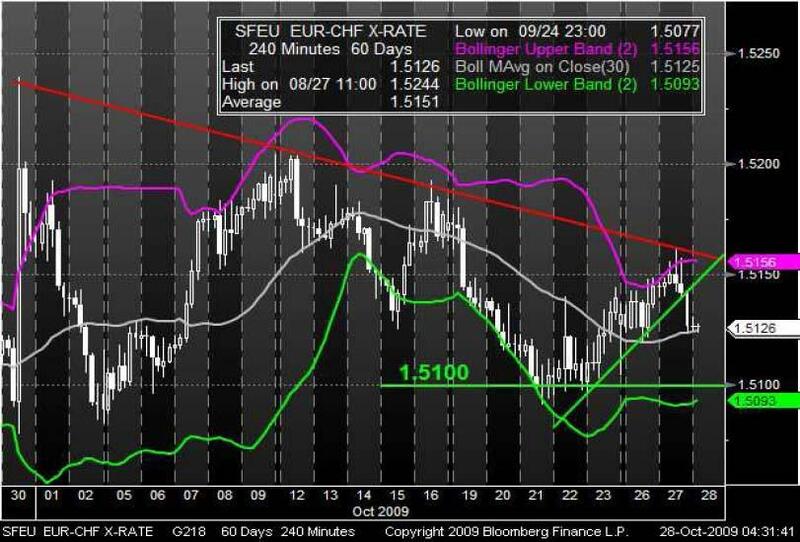 Since the beginning of October, the EUR traded below a bearish trend line against the CHF. After touching the downward trend line the fourth time, the market crossed its shortterm bullish trend line and reached the middle Bollinger Band. If the market would cross this band, it could fall further towards the lower Bollinger band around a potential support line at 1.5100. 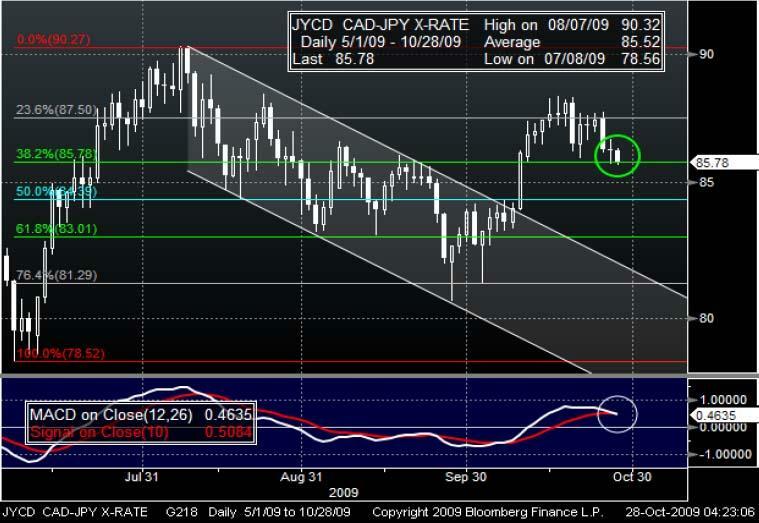 After crossing the upper line of the bearish trend channel, the CAD/JPY gained further and reached a high at 88.30. At the moment the pair trades around the 38.2% (85.78) Fibonacci retracement line while the MACD seems to show a trend reversal. If the currency pair breaks through the 38.2% Fibonacci line, it could force further losses towards the 50.0% retracement level.